After a whole lot of work, a woman will become the eleventh bride in her family to wear the same 120-year-old wedding dress. Eat your heart out, Etsy-cruising “vintage-inspired” party planners. 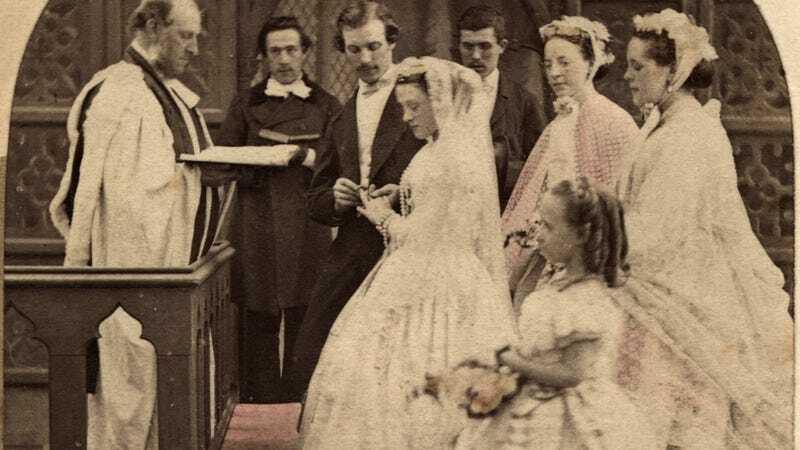 Lehigh Valley Live tells the story of Pennsylvania-born Abigail Kingston, who wanted to wear the same dress as her mother and numerous other female relatives. Originally, it had been worn by her great-great grandmother at her 1895 wedding in Buffalo, New York. But it took some pretty painstaking restoration efforts, because the century-old gown was showing its age—satin discolored, holes all over, and clearly cut for a time when Americans were shorter. Plus, it had been altered by successive brides over the years. Even so, the dress is so fragile she’ll wear it just for the cocktail reception. But it looks spectacular. Sorry in advance for when you mom emails you this story, asking if you’re absolutely sure you don’t want to wear her gown from 1986, designed to look just like Fergie’s. Photo via Getty. Not the same dress.